Check out the tools to start building your Doctors’ Choice Awards reputation. The Best Way To Get Reviews: Ask! A great review is key to getting noticed. It’s also the best way to learn what your peer’s thought about his or her experience with you. After an appointment or seminar, thank your doctor clients, friends or colleagues and let them know you really appreciate their feedback. Follow up with them a few days later to see if everything is still to their satisfaction. This is great time to reiterate that you take their feedback to heart and use it to find ways to continually improve your service. Post often to your social media accounts, thanking doctors for the feedback they leave. Let them know that they best compliment you can receive is their review on Doctors’ Choice Awards. If your colleagues have already given you testimonials, send them to info@doctorschoiceaward.org along with the doctor’s full name and email and we will add the reviews to your Doctors’ Choice Awards profile on your behalf. Reviews are a great way to provide a portfolio of the quality work you do. 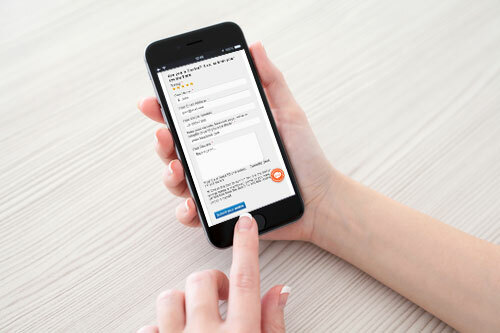 The more reviews you collect, the more attractive you can look to potential patients. It’s easy to add your DCA URL into your daily business routine. [insert your DCA profile link here] to leave your review. Your review can be short and sweet – it should only take a couple of minutes. Thank you for your willingness to help me win the 2016 Doctors’ Choice Awards. It was a pleasure to work with you, Dr. ______________. 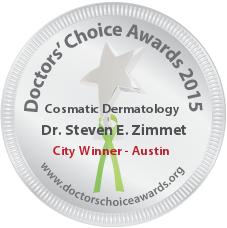 [insert your DCA profile link here ]to help me win the 2016 Doctors’ Choice Awards. Add your personalized DCA URL to your business card and attach it to invoices, receipts or other marketing materials. It’s always nice to follow up with your doctor clients, referring doctors to make sure everything is still satisfactory. Include your review link in your email signature to help encourage their feedback. 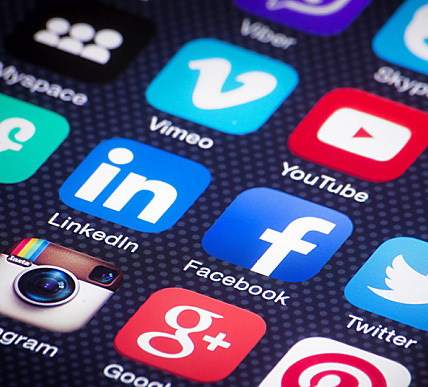 Social media is a great way to connect with potential patients and get the word out about your practice. You can post updates about you, your practice, your DCA profile url and also remind doctor clients, referring doctors and colleagues to leave a review if they’ve worked with you. As you have many connections who have already endorsed you on LinkedIn perhaps you can send them a private message with your profile link requesting them to review you. Don’t forget to review me on Doctors’ Choice Awards and help me win the 2016 Award! Visit [insert your DCA profile link here] to leave your review. The greatest compliment you can give me is your feedback! Visit [insert your DCA profile link here] to leave your review. Hello my fellow doctors, Please click this link [insert your DCA profile link here] and add a couple of nice things that you can tell about me and help me stand a chance to win the 2016 Doctors’ Choice Awards. Your voice matters and I’d really appreciate your support. Collect reviews from doctor friends or colleagues who you have a mobile number for. Collection via SMS is 3x times more effective than email review collection and 80x more effective than a paper based review request. Staple to paper invoices or business cards. Email attachment to electronic invoices. Insert in a thank you card. Set out at the front desk. Login to your account to get your personalized review form. Need some help collecting reviews? Not a problem. With our free Review Collection program, we can help track down reviews from doctors who haven’t given their feedback yet. The process is easy and your information is kept completely confidential. Just log in to submit your doctor list and our representative will reach out to only those who are already members in Doctors’ Choice Awards. 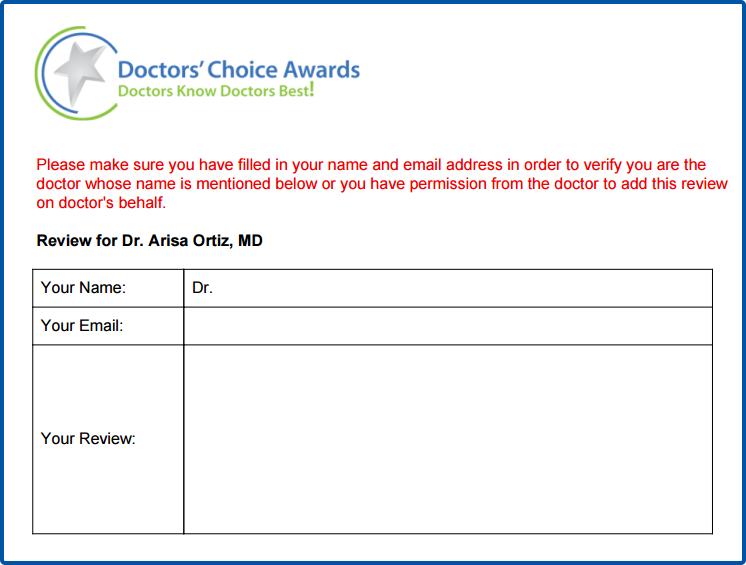 Email our team with any questions so we can help you collect and promote feedback from Doctors’ Choice Awards members. Reviews collection program makes it easy for you to obtain feedback from your doctor friends, colleagues, referring doctors already on Doctors’ Choice Award. Upload individual details or bulk upload a doctor list and your list will be safe with Doctors’ Choice awards team. When they find a match they reach in hopes of securing a review on your behalf. It will invite them to rate and review your Doctors’ Choice profile to submit their feedback. Every time you receive a review, Our Feedback Centre will alert you by email. The reviews goes through a rigorous verification process for validity of the review and the physician who reviewed. 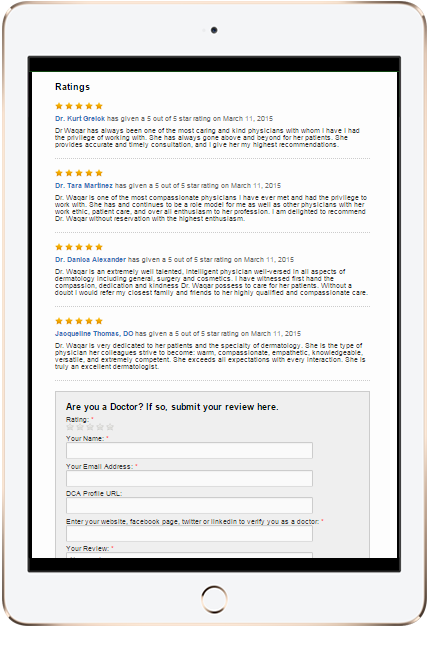 We will send a Thank you email to the doctors who submitted a review for you. Once you have 3 or more reviews in your DCA Profile, you receive your very own Doctors’ Choice Awards badge to display proudly on your website, social media, email signature and newsletters. Depending on the number of reviews you receive during the month compared to other doctors on the site you can be a Top Doctor for the month. 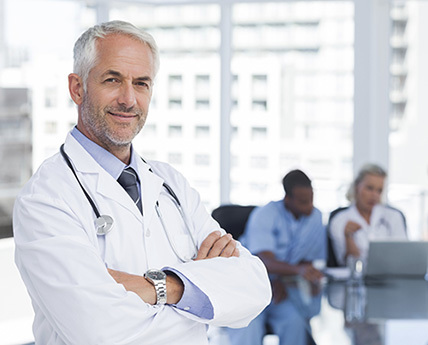 Display your TOP DOCTOR OF THE MONTH badge on your website, social media, and other marketing materials to tell the world that you are a Top Doctor! Get the highest number of reviews in your specialty compared to all the doctors for every country that were represented and become eligible to win the National Winner Award. Every November we select winners by every country based on the number of quality reviews obtained within the year. You can also add the Doctors’ choice awards website widget to your website, Facebook Reviews App to your FB business page and showcase the credibility of your services. New To Doctors’ Choice Awards? What are you waiting for? Submit your Nomination today and start collecting reviews.